"Separate panels are joined in this composite image. Date estimated based on the apparent library acquisition date usually stamped on the back of the map sheet. Mounted on linen in 4 panels. Publishing bookstore and distributor: R. Eisenschmidt, Verlags-Buchhandlung. Haupt-Vertrieb der Karten der Konigl. Landes-Aufnahme. Armee- und Marine-Haus. Berlin N.W., 7. Comparing our sheets to those at the Library of Congress shows that most of our sheets were published 5 to 10 years before the stamped acquisition date. A few sheets are duplicated and placed under similar list numbers. This map series is remarkable for the level of fine detail. As a consequence, it was scanned at 800 PPI providing four times the resolution of the typical detailed map scan of 400 PPI. At least ten separate symbols for special buildings were utilized, a method enhanced by placing an abbreviation next to the symbol. Structures with special symbols include: churches, chapels, monuments, windmills, water mills, stamp mills, forester's lodges, watchtowers, ruins, forts, quarries, clay pits, lime kilns, and coke-ovens. Factories, brick works, powder magazines electric power plants, and many other important buildings are differentiated by means of abbreviation. Houses appear as black blocks, either rectangular or shaped like the ground plan of the building. Many other features are differentiated, for example there are four different qualities of roads plus bridle paths and footpaths. Vegetation is minutely classified including separate symbols for broadleaf trees, evergreens, underbrush, heather, dry meadows, wet meadows, swamps, orchards, gardens, vineyards, and parks. Relief is shown by hachures. Spot elevations are given in meters above sea level. 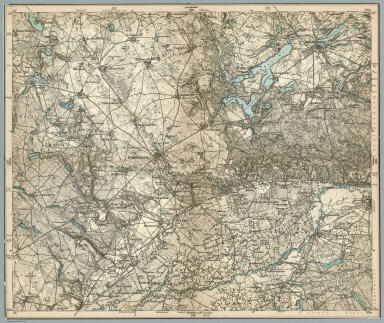 In an agreement dated March 4, 1878, the states of Prussia, Saxony, Bavaria, and Wurttemberg (the areas of modern day Germany, Luxembourg, Poland, and Kaliningrad, and part of Lithuania) agreed to map their areas on a 1:100,000 scale in a common topographic grid survey consisting of 674 sheets. Each sheet covers about 30 minutes in longitude and 15 minutes in latitude. One centimeter on a map is equivalent to 1 kilometer on the ground. Average sheet size is about 35 cm x 28 cm. Each sheet covers about 1000 square kilometers and was engraved on copper. A polyhedral projection was used. Prime meridian was Ferro, later switched to Greenwich. The series is known as the KDR-100 (German General Staff map) and was surveyed beginning in 1878, although many sheets were simply drawn from pre-existing military maps, often of larger (more detailed) scale. The mapping continued until 1945, so most sheets were revised at least once. This collection strongly trends toward the earliest editions. They were published for the General Staffs of Bavaria, Prussia, Saxony and Wurttemberg by ""R. Eisenschmidt, Verlags-Buchhandlung"" (publishing bookstore). (Berlin). Key organizations indicated on the maps include (1) Topographic Bureau of Royal Saxony, abbreviated in German as ""topogr. bureau des konigl. sachs."" And (2) Royal Prussian General Staff, abbreviated in German as ""Kgl. Preuss. Generalstab."" Most sheets stamped with ""The Library of Massachusetts, State House, Boston,"" and the apparent date of acquisition. Almost all of the sheets are trimmed to the neatline to allow for closer alignment of multiple sheets when viewing, apparently a common practice by publishers of the sheets. Therefore the printed publishing date has been removed and we are estimating the date based on the acquisition stamp date."